With over 30 years of experience, V1 offers a proven solution with a tangible ROI across both on premise and privately hosted cloud platforms. 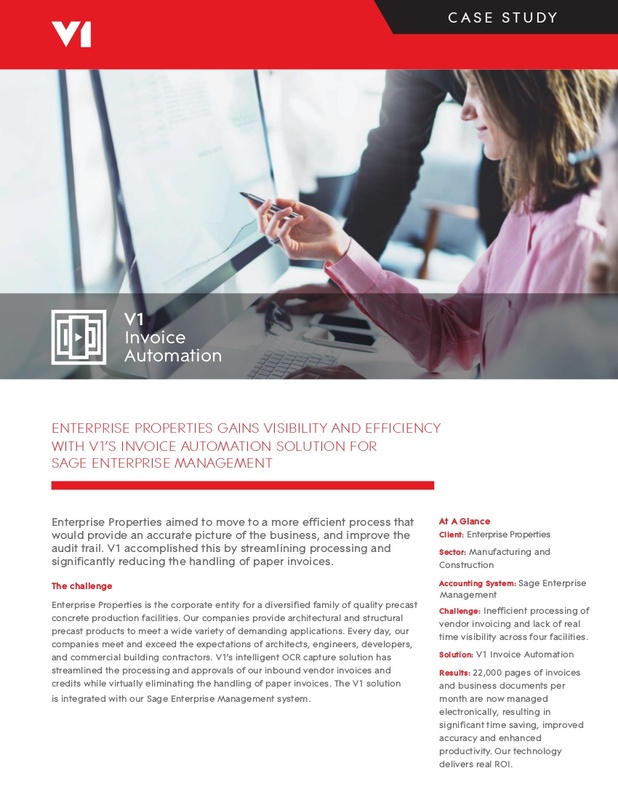 V1’s Intelligent Document Management and Invoice Automation solutions are known for their seamless integration into Sage Enterprise Management. 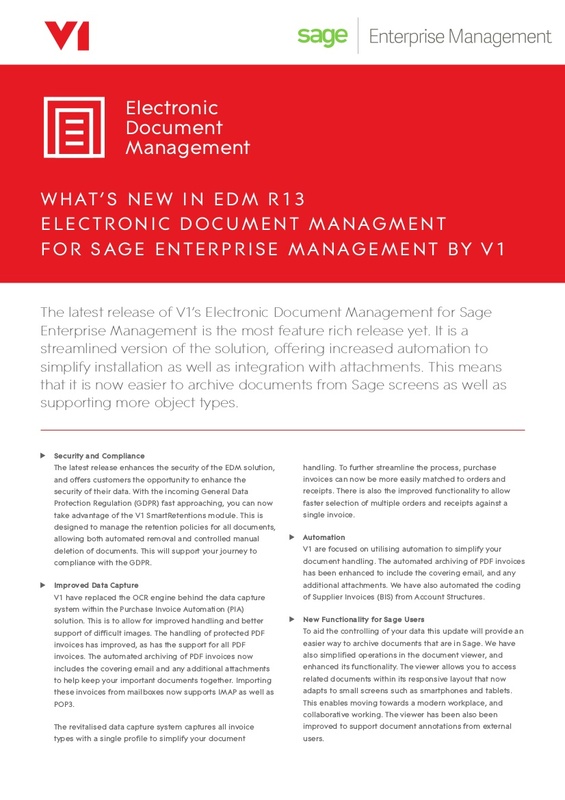 Therefore, at Southeast Computer Solutions we are proud to be a reseller of V1. V1 helps 2,000 companies automate their core business processes to drive efficiencies and win back time for higher value activity; finance teams can operate at their full potential, using the solutions to adapt the way they work. Productivity barriers will be unlocked, transforming how operations are run, how documents and data is stored and helping finance teams and beyond win back time to spend on analysis. Send finance documents like sales invoices and orders electronically directly from the core business management system using intelligent Document Management. 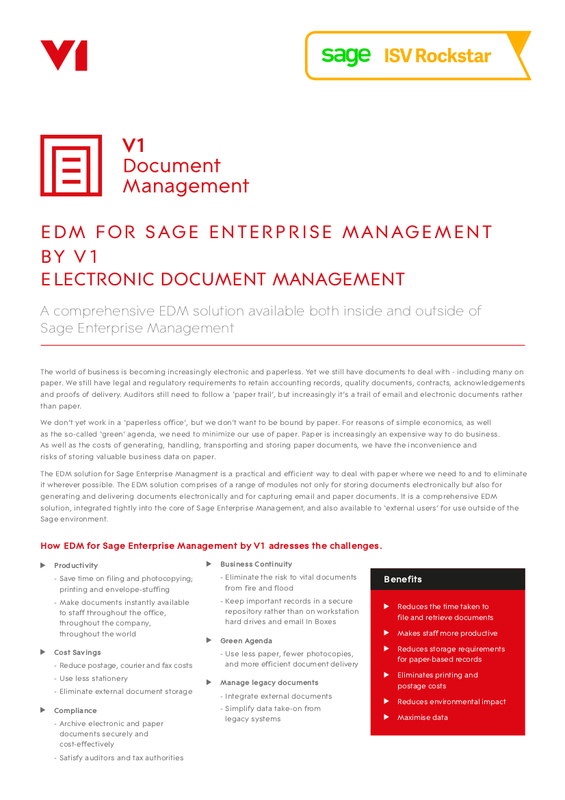 Secure archiving and easy retrieval of finance documents directly from Sage Enterprise Management using the document management features. Use cognitive capture to enable intelligent, touchless entry of purchase invoices and sales orders via intelligent cognitive capture technology. The capture software reads and interprets semi-structured documents intelligently, using technology to understand how to capture and extract the right data and drive efficient workflows. It then verifies and validates your invoices before posting them to your purchase ledger.